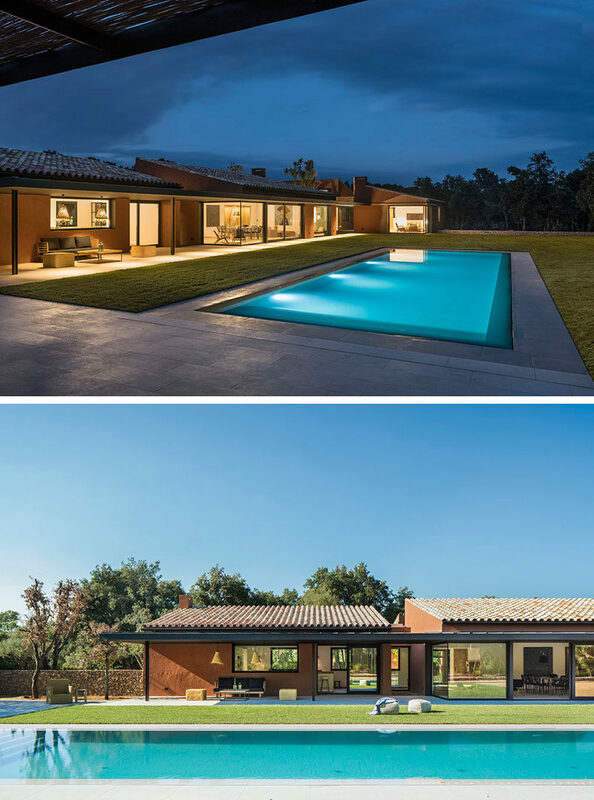 Interior designer Susanna Cots, has completed her latest project, the contemporary interior of a house that’s located in the Empordà region of Barcelona, Spain. Inside the home, an angled wood partition separates the living room from the hallway. 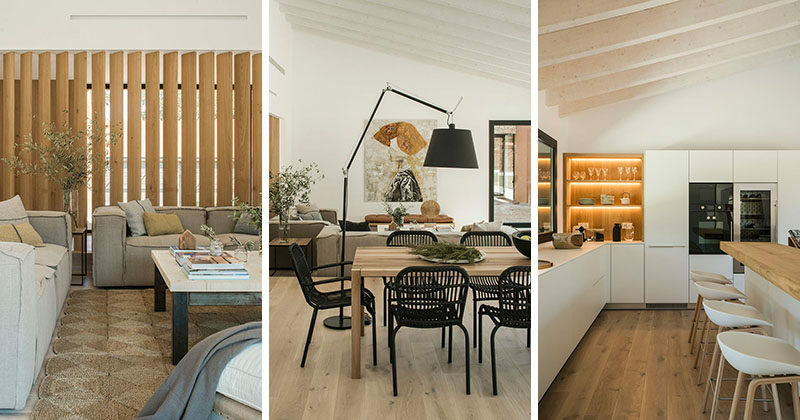 The use of natural colors, textures and fibers in the living room creates a relaxed environment. Behind the living room is the dining room, where a wood dining table is surrounded by black dining chairs. In a light-filled corner of the house, a small sitting area sits in front of large windows that provide a view of the landscaped lawn. In the kitchen, a sloped ceiling creates a feeling of space, while the kitchen has been split up into three different work areas with a long wood bar top and island positioned in the middle. Throughout the kitchen, white minimalist cabinets are the main storage elements, while exposed wood shelving with back-lighting highlights a few favorite items. 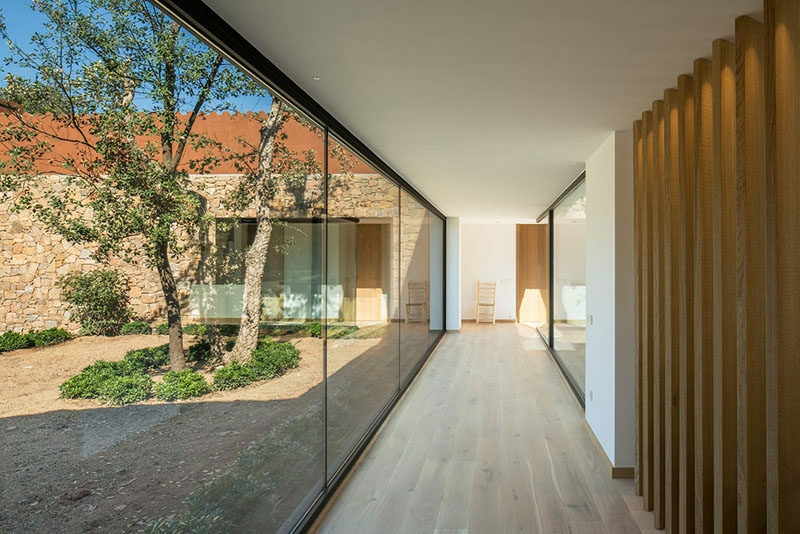 A wall of floor-to-ceiling windows with a view of a courtyard line the hallway that leads to the various areas of the home. In this bedroom, simple furnishings help to create a sense of openness, while a sitting area has views of the backyard and swimming pool. A black-framed door gives the bedroom direct access to the outdoor spaces. In the bathroom, built-in wood shelving with back-lighting provides a place to store bathroom items, while a freestanding bathtub sits against the wall. Opposite the bathtub is the toilet and shower that are separated by a glass shower screen, and next to the bathtub is a floating vanity.